China’s high-end J-11D fighter aircraft, a copy of the Russian Sukhoi Su-27 jet, made a maiden flight. 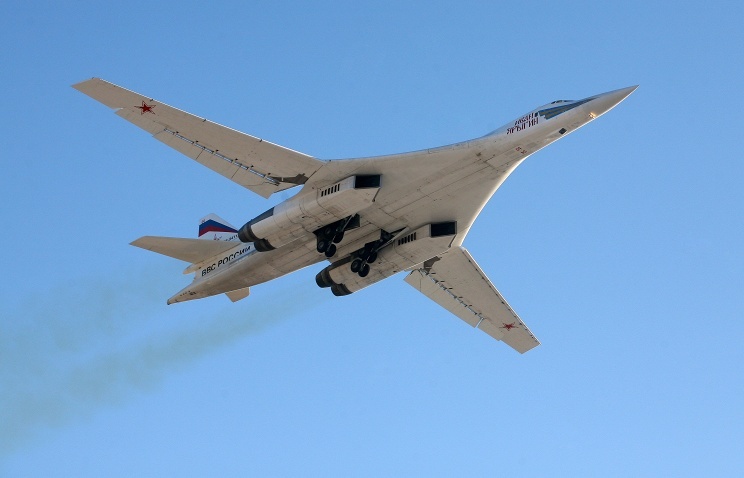 MOSCOW (Sputnik) — China’s high-end J-11D fighter aircraft, a copy of the Russian Sukhoi Su-27 jet, has made a maiden flight, local media reported Thursday. Photos uploaded to the Internet on Wednesday show the latest modification of China’s domestically-constructed J-11B aircraft, initially designed as a copy of the Soviet-made Su-27, the Sina.com news portal said.Unlike its predecessor, the J-11D model reportedly has phased-array radar and an air refueling system, and carries PL-10 air-to-air missiles. Former CIA analyst Allen Thomson has compiled and analyzed the shots captured by Russia’s Altay Optical Laser center somewhat between 2005 and 2010. The existence of the Lacrosse terrestrial radar imaging reconnaissance satellites, operated by the US National Reconnaissance Office (NRO), was not officially confirmed for a long time, its existence was declassified only in 2008. Lacrosse satellites use synthetic aperture radar as their prime imaging instrument. It is able to see through cloud cover and its gaze also has some ability to penetrate soil. The name Lacrosse is used to refer to all of these orbital spycraft, while there is another name, Onyx, which is sometimes used to refer to the three newer units. Five Lacrosse spacecraft have been launched, and three are currently in orbit. “The [released] images contain enough information (range, angular scale) to perform a bit of technical intelligence (i.e., sophomore high school trigonometry) on the radar antenna size, which is a significant parameter affecting capability,” Thomson said, as quoted by the US media. “Why did the Russians release the images? The US is highly paranoid about releasing resolved images of spysats, ours or others. The Russian paranoia is at least as great, so how did these images get out? What was the purpose?” Thomson questions. Then Thomson however supposed that it might be a way “to respond to our [their] space advantage”, citing Gil Klinger, a defense intelligence official, who testified at a 2014 House Armed Services Committee hearing on US national security space activities. Klinger then said that the US asymmetrical advantage in space “also creates asymmetrical vulnerabilities”. The answer came from the German news site Deutsche Wirtschafts Nachrichten, which supposed that it is a way to show that “Moscow always knows what the US is up to”. 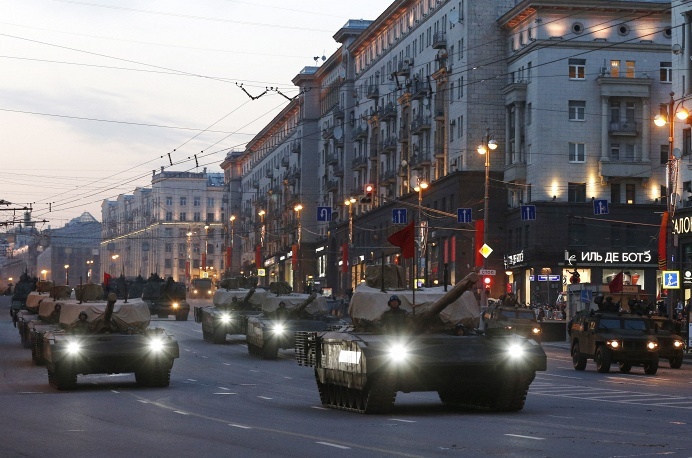 MOSCOW, April 30. /TASS/. 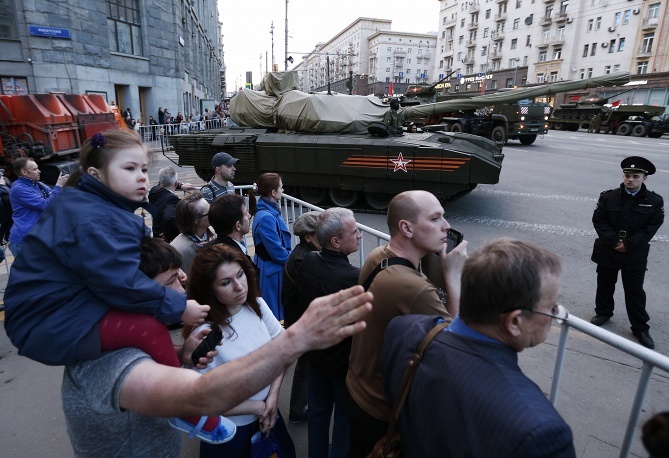 The new Armata tanks and the Kurganets-25 infantry fighting vehicles for the first time rolled through Moscow’s Red Square in a night rehearsal of Victory Day parade, a TASS correspondent has reported. MOSCOW, April 29. /TASS/. 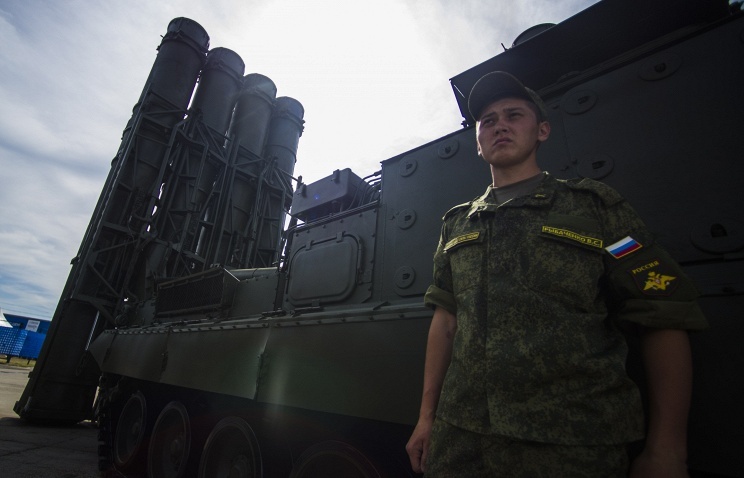 A third batch of equipment for a regiment of the S-400 “Triumph” air defense missile systems has arrived from Vladivostok to Petropavlovsk-Kamchatsky, spokesman for Russia’s Eastern Military District Roman Martov said on Wednesday. “The batch comprises more than 50 units of equipment, spare parts and accessories of the S-400 missile system that will soon replace the S-300. The rearmament will be completed soon and the new S-400 air defense missile system will be put on combat duty to protect air frontiers of Russia’s northeast,” Martov said. The first batch that included more than 20 equipment units for the S-400 system had arrived in Kamchatka in early February. The second batch arrived to the peninsula in April. According to previous reports, the delivery of the regimental set of the Triumph missile systems will take five trains. A Russian Defense Ministry source told TASS previously that the S-400 regimental set for Kamchatka would comprise three battalions, and not two as before. The S-400 missile systems are already protecting the skies over Moscow and St. Petersburg, and Severomorsk – the headquarters of the Northern Fleet, the Kaliningrad region – the most western part of the country, locked between Poland, Lithuania and Belarus and home to Russia’s Baltic Fleet, and also southern regions and the coast of the Sea of Japan in the Far East. The S-400 is a new generation anti-aircraft system, which can be equipped with very long-range missiles (up to 400km), long-range (250km) and medium-range (120km). It’s capable of shooting down anything from small aircraft to cruise missiles such as the Tomahawk, and even ballistic missiles armed with nuclear warheads. The United States Central Intelligence Agency (CIA) ran an extensive worldwide network of black-sites and has since passed on its torture practices to local authorities, investigative journalist and winner of the Ridenhour Book Prize for truth-telling, Anand Gopal told Sputnik. WASHINGTON (Sputnik) — Gopal, who served as an Afghanistan correspondent for multiple US newspapers, explained that United States Army commanders in Afghanistan are “very well aware” of the torture practiced by Afghan security forces and warlords. Individuals who are accused of terrorist activities “will be taken away, they will be beaten, tortured and many times killed,” Gopal said. The practice is not done by “rogue elements,” he argued, but has become “standard operating procedure” during the US War on Terror.A February 2015 United Nations report documented the forms of torture taking place under the Afghan security forces, and local warlords. Former Romanian President Ion Iliescu brought to light new revelations on US overseas black-sites when he confirmed that Romania had hosted at least one CIA facility. In a Wednesday blog post, Iliescu acknowledged that he had approved CIA requests to set up at least one black site in Romania where detainees were held and subjected to torture. The Pentagon has urged the US Senate to soften sanctions against the use of RD-180 Russian rocket engines by American companies, the Russian news agency RIA-Novosti reported.The RD-180 is used in the first stage of US Atlas 5 rockets, and thus far there has been no US alternative to the Russian engines. Earlier, Congress passed a legislation barring the use of the RD-180 on future military missions. In particular, the 2015 National Defense Authorization Act directs the US Air Force to wean itself from the Russian-built propulsion system by 2019. The ban was drafted in connections with the situation in Ukraine. A separate piece of legislation provided 220 million dollars to the Air Force earlier this year to begin development of a US alternative to the engine. Speaking at a Senate Armed Services Subcommittee, Air Force Secretary Deborah Lee James proposed a spate of amendments to the law so that the US could buy the RD-180 engines that were ordered from Russia before the events related to Crimea’s reunification with Russia. The US has yet to pay for these engines. Senator John McCain, who is notoriously known for his anti-Russian rhetoric, was quick to wonder “whether it was in the interests of the United States is to subsidize the Russian defense industry, given Russia’s behavior.””No. It’s regrettable, but guaranteed access to space is much more important,” the Pentagon spokesman answered quoted by the Air Force Times. In March 2015, the US announced a tender for space launches in connection with the ban on Russian rocket engines RD-180. The tender will be held for 28 launches, due to be conducted between 2020 and 2024.